Brochure Pocket for Sign Stand - Acrylic A4 - Ships Same Day! Brochure pocket for sign stand attaches easily to post with minimum setup time! This brochure pocket for sign stand is designed to hold A4 (297 x 210mm) standard sized literature and catalogues in portrait orientation. The holder can also display (2) DL (99 x 210mm) pamphlets side by side, making it easy to offer visitors different take away information on your promotional stands. The pocket angles upwards as well, making it easier to read the fronts of items placed in the dispenser. 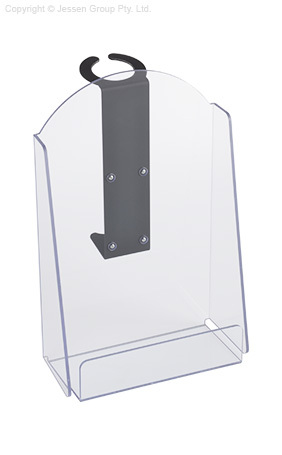 The brochure pocket for sign stand, great for use with signage displays, is made from 4mm thick clear plastic featuring polished edges, providing a durable display with the visual appeal of glass at a lower price point. The holder also has a raised front edge which prevents brochures from slipping off and falling to the ground during use. Use this display in expos, exhibition halls, university events, and more to provide visitors with easily accessible take away information. The included steel bracket has a black finish to complement signage displays perfectly. The bracket attaches to the pocket with a screw driver, making it really easy to set-up in seconds. Then the bracket can be attached to the pole with no tools necessary. Simply slide the bracket over the post and attach the poster frame over it securely. The cut-out on the bottom of the bracket rests against the centre pole and helps keep the dispenser in place. Order today by 2pm EST for same day Australia-wide despatch with this and most other in stock products, only from Slimline Warehouse!